Two kionedon inscriptions on the front: NIKOΔEMOΣ EΠOIEΣEN (Nikodemos made it); TON AΘENEΘEN AΘΛON ([Prize] from the Athenian Games). The Panathenaia, a state religious festival, honored Athena, the patron goddess of Athens. Held in its expanded form every four years, the festival included athletic, musical, and other competitions. Amphorae filled with oil pressed from olives from the sacred trees of Athena were given as prizes in the Panathenaic Games. These amphorae had a special form with narrow neck and foot and a standard fashion of decoration. One side showed Athena, the goddess of war, armed and striding forth between columns, and included the inscription "from the games at Athens." The other side showed the event for which the vase was a prize. Leading vase-painters, commissioned by the state, decorated these vessels, which continued to be decorated in the black-figure technique long after it had gone out of fashion for other vases, probably due to religious conservatism. The same conservatism applied to the depiction of Athena. 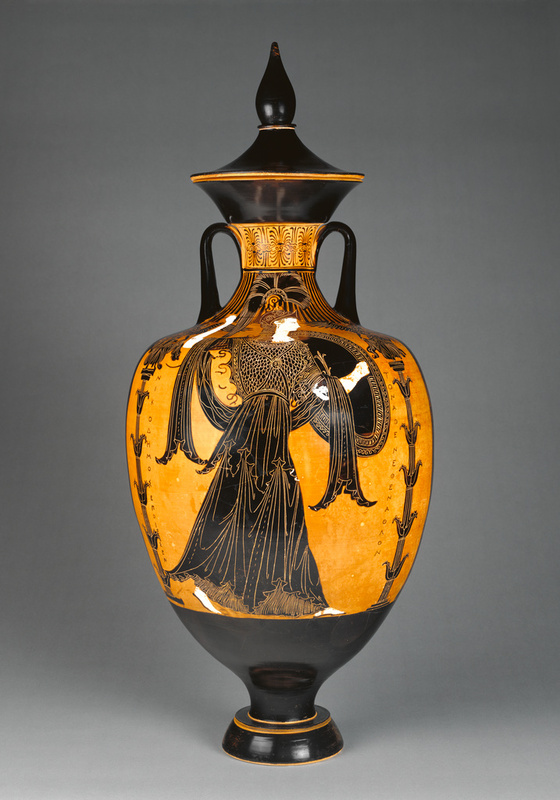 On this example, the figure of Athena is portrayed in an Archaistic or old-fashioned style. The Nike figures atop akanthos columns flanking Athena are a detail that allows scholars to date this vase precisely to 363/2 B.C., and an inscription records the name of its maker, Nikodemos. The back of the vase depicts Nike, the goddess of victory, crowning the winner of a boxing match between young men, while an older, bearded judge looks on. The leather thongs held by the youths identify them as boxers; they were wrapped around the hands and served as the ancient equivalent of boxing gloves. In 370 B.C. the victor in youth boxing won forty amphorae of oil; the second place winner took home eight. "Acquisitions/1993." The J. Paul Getty Museum Journal 22 (1994), p. 63, no. 8. The J. Paul Getty Trust Bulletin 8, no. 2 (Spring 1994), p. 15. Eschbach, Norbert. Review of Panos Valavanis, Panathenaichoi Amphoreis apo ten Eretria. Gnomon 67 (1995), pp. 455-463, pp. 457, 459, 462-63. The J. Paul Getty Museum Handbook of the Collections. 4th ed. (Los Angeles: J. Paul Getty Museum, 1997), p. 51. Towne Markus, Elana. Masterpieces of the J. Paul Getty Museum: Antiquities. (Los Angeles: J. Paul Getty Museum, 1997), p. 53. Bentz, Martin. Panathenaeische Preisamphoren. Eine Athenische Vasengattung und ihre Funktion vom 6.-4.Jahrhundert v. Chr. Antike Kunst Suppl. 18. Basel: 1998, p. 170, no. 4.024; pl. 111. Tiverios, Michalis. Makedones kai Panathenaia. Athens: 2000, pl. 8. Badinou, Panayota. Olympiaka: Anthologie des sources grecques (Bienne, Switzerland: International Olympic Committee, 2000[? ]), p. 24. Immerwahr, Henry. R. A Corpus of Attic Vase Inscriptions. Preliminary Edition. Part VI: Supplement. 2001, no. 5033. The J. Paul Getty Museum Handbook of the Collections. 6th ed. (Los Angeles: J. Paul Getty Museum, 2001), p. 51. The J. Paul Getty Museum Handbook of the Antiquities Collection (Los Angeles: 2002), p. 82. Spivey, Nigel and Squire, Michael. Panorama of the Classical World (Los Angeles: Getty Publications, 2004), p. 41, fig. 59. Laurin, Joseph R. Homosexuality in Ancient Athens (Victoria, Trafford, 2005), p. 115, fig. 7. Sacks, David. Encyclopedia of the Ancient Greek World (New York: Facts on File, 2005), p. 238, ill. The J. Paul Getty Museum Handbook of the Collections. 7th ed. (Los Angeles: J. Paul Getty Museum, 2007), p. 34, ill. The J. Paul Getty Museum Handbook of the Antiquities Collection. Rev. ed. (Los Angeles: J. Paul Getty Museum, 2010), p. 80. Sparkes, Brian. Greek Art. Greece and Rome: New Surveys in the Classics 40 (Cambridge: Cambridge University Press, 2011), pp. 102-103. Langner, Martin. “Grundlagen der Chronologie spätrotfiguriger Vasen aus Athen.” BABesch 88 (2013), 127-170, 132-133, fig. 6d. Sofroniew, Alexandra. Household Gods: Private Devotion in Ancient Greece and Rome (Los Angeles: J. Paul Getty Museum, 2015), p. 53, fig. 25. Eschbach, N. Pananthenäische Preisamphoren aus dem Kerameikos zu Athen. Kerameikos 21. Berlin: Dr Ludwig Reichert Verlag Wiesbaden, 2017, 295, no. 1. Bolmarcich, S. and Muskett, G. "Artists' Signatures on Archaic Greek Vases from Athens." In Artists and Artistic Production in Ancient Greece, edited by K. Seaman and P. Schultz. Cambridge: Cambridge University Press, 2017, 161-162, fig. 10.3. McPhee, Ian. “An Attic Red-Figured Pelike in the Abegg-Stiftung” in Studi Miscellanei di Ceramografia Greca IV, edited by Elvia Giudice and Giada Giudice (EDIARCH: Universita di Catania, 2018) 71-79, 77, footnote 42.